Low prices. OrangeSmile.com offers car hire service in Kuwait on the lowest-rate-guarantee basis, since we work with car suppliers directly. For your search criteria in Kuwait, we always select and show the best rental offers. The car reservation process consists of 3 simple steps: (1) search for available cars for your dates in Kuwait; (2) select your car type; and (3) fill in the booking forms. Once the reservation is completed, you will receive a confirmation voucher to your email address. During the booking process, please check your rental conditions. To pick up your car at the rental point in Kuwait, you need to provide our confirmation voucher, your driving license and a valid credit card. The final payment is normally carried out at the pick-up point. Our car hire points in Kuwait accept VISA, MasterCard, etc - please check your rental conditions. At the pick-up point, please read the handling manual and check the car for present defects. OrangeSmile.com wishes you a pleasant journey to Kuwait! The car hire reservation system OrangeSmile.com allows renting a vehicle in Kuwait within 10 minutes. Our largest database of car suppliers enables us to provide you a rental car in Kuwait at the cheapest rate ever possible. At rental locations in Kuwait we offer the following car sizes: mini, compact, economy, standard, premium and luxury. The following car types are available in Kuwait: Sedan, Hatchback, Jeep, Cabriolet, Coupe, Minivan and Minibus. In the past, Kuwait had to undergo tough war times, but nowadays it’s a peaceful country, which billion dollar oil industry allowed performing of a massive restoration and building modern metropolises. Nowadays, the country attracts numerous travelers who come to rest on Failaka Island, discover sights of Kuwait City and enjoy spectacular beach rest. Scuba diving and snorkeling become increasingly popular in Kuwait. In order to make underwater life even more picturesque, many coral reefs are being restored in the country. Even without diving, beautiful white sand beaches are very captivating, so rest in one of numerous resorts of the country will leave many pleasant memories. 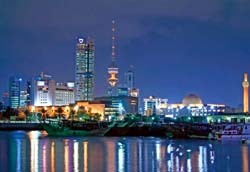 Kuwait Towers have quickly become a symbol of Kuwait City, the capital of the country. The three towers were finished in 1979. The main tower is 187m high and is open for visitors. There are an observation deck and a restaurant at the height of 123 meters; the tower rotates slowly and makes a full circle in 30 minutes. The other two towers are used to store water for emergency needs and control electricity. Kuwait Towers were damaged severely during the war, but were restored later. Salmiya and Hawalli are considered the main residential and business parts of the city. The Science Center located in Salmiya is a great place to visit for both adults and children. The center is located near the waterfront and a beautiful marina. As-Seef Palace and Bayan Palace are considered the most beautiful palaces in the city. The first palace is one of the residences of the Emir, while the second one is used as the government quarters. There are some attractions outside Kuwait City as well. Jal Az-Zor Nature Reserve, which is located not far away from the capital, is a great place to see migratory birds. Some of the birds like Black Vulture are very rare and nearly impossible to see in other parts of the world. Other famous nature reserves in the country are Sulaibikhat Bay, Dawhat Kazima, Al-Jahra Pools Nature Reserve, Ad-Doha Nature Reserve and Coral Islets. Travellers are also welcome to explore the desert and see wild animals there. Kuwait is a popular destination for shopping fans. Giant shopping malls, walking streets with various shops, finest jewellery stores and trendy boutiques will certainly make hearts of fashionista beat faster. To avoid problems at the pick-up location in Kuwait, it is very important to enter your personal data in the reservation form correctly. The insurance deposit amount in Kuwait is defined by the rental office and is based on the highest franchise of all included insurances.